Temperatures will be slightly cooler for the coming week after Sunday starts off with a chance of isolated thunderstorms followed by heavy rain. Sunday's high will be in the lower 90s. Chances of precipitation will increase as the day progresses. Heavy rain is possible later into the evening and mainly ending before 3:00 a.m. Watch for one-half to three-quarters of an inch of rain overnight and the potential for flash flooding, particularly in the western two-thirds of Kiowa County. Thunderstorms may return Tuesday through Thursday afternoon and evenings. High temperatures will largely remain in the lower 90s through the week, however Tuesday and Wednesday will be closer to 95. Overnight lows will be in the mid-60s throughout the week. 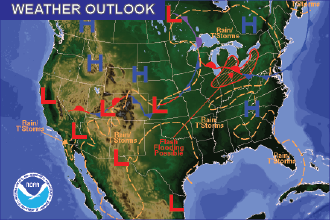 Weather Outlook – the Week Ahead: Rain Thursday?